saturday morning we lounged around in bed, trying to convince ourselves to get our day going. we eventually freshened up and made the lovely walk to the eastern market area. the weather was just GORGEOUS. i could not get over how beautiful it was, and i counted myself quite lucky that we were able to spend the day outside in the sunshine, catching rays and just enjoying everything around us. evan had been gushing over the vendors at eastern market on the weekends, so that was our first stop. i love farmers’ markets and exploring local talent and cuisine, and it was the perfect day for a stroll through the tents. we first stopped at one of her favorite booths that boasted scarves and jewelry and all sorts of accessories. yes, please! evan immediately found an achor scarf that was quite adorable, and i spotted one that i thought was quirky and fun enough for alison back in atlanta. it just so conveniently happened that i found one for myself also…oh! and look at all these rings and bracelets! i’ll take one of each! well, not that many, but i did end up with two rings and a bracelet from nepal (ooh, how worldly of you, kelsey) and a few wooden rings that were quite hip as well. after dropping some nice cash there, we moseyed in and out of the other tents, somehow resisting all the impulsive purchases we wanted to make. evan took me over to the stand of a gentleman who makes beautiful cutting boards. we gushed over them for several minutes; they were just gorgeous. evan had said she’d been thinking about getting one ever since last year but could not bring herself to spend that much money on a cutting board (they are masterpieces, so it’s no surprise they are a bit expense). i proposed we grab some brunch to think it over, and we promised the vendor we would be back after filling our stomachs. we decided we’d like to try some place new to the both of us, and all the diners on the patio of montmarte looked quite content with their drinks and plates. i insisted we sit outside to catch some sun, and we were seated about fifteen minutes after putting down our names. we fit right in the with the locals, looking like two socialites of the city grabbing brunch before the rest of the day unwound. although evan had never heard anything about montmarte, it was a fabulous experience that was worth the wait. the mimosas were tart and refreshing, and we didn’t stop them coming throughout the meal. the service was kind and attentive and as pleasant as the day. doesn’t this sound like a place you want to be? evan ordered the eggs benedict with smoked salmon while i went for the bretonne crepe. evan declared hers was some of the best eggs benedict she’d ever had and that the salmon was just wonderful. my crepe was light but quite filling. i would order it again in a heartbeat with all that spinach and swiss cheese and egg and bacon. NOMS. p.s. i just noticed that they have a beets and cheese dish on the appetizer menu. how did i not see it before?! clearly i’ll be back here on my next visit to dc. since we were making quite the afternoon out of our brunch, it was an easy decision to order dessert. we had seen a brownie, cake-like concoction a few tables over and knew we just had to try it as well! 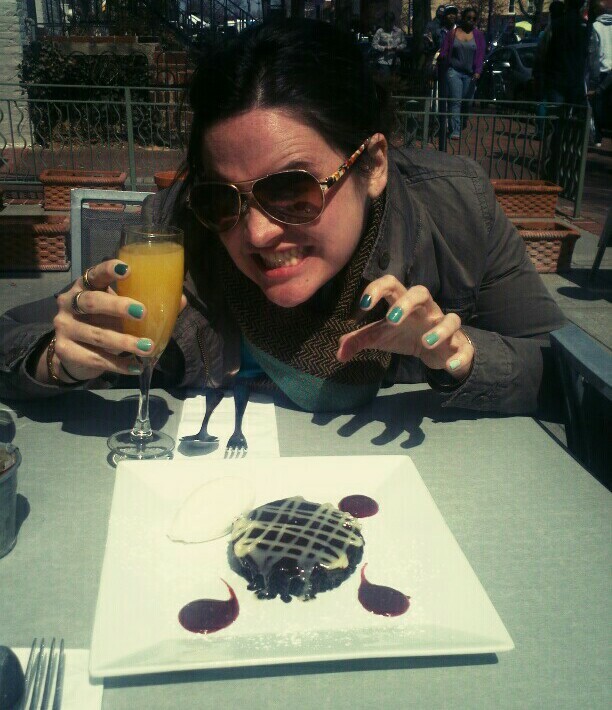 and in case you were wondering what i look like when i’m hungry for chocolate and after i’ve had three mimosas, well, here you go. such a lady, i know. we paid, had a new-found lightness about us, and went right back to the market to buy not just one but three cutting boards. isn’t it something, what a little bubbly can do for ya? we nearly skipped home, overjoyed with the lovely afternoon we were able to have. i insisted we display the cutting boards right away while also painting the most wonderful picture for evan. think of all the fabulous entertaining you can do with these! one board can hold an artisan loaf of bread and the sweetest little knife. the other can host an assortment of gourmet cheeses, maybe some drizzled with jam or honey. the third will obviously be for the crackers and fruits to accompany the rest. oh, goody! doesn’t it all sound so magical? i thought so! after our waterfront adventures, we went home, got all dolled up, and took the scenic walk to nationals park to watch the braves take on the hometown team. i love baseball and will shamelessly support it as america’s pastime until the day i lie down in the ground. honestly, is there much better than relaxing with hotdogs and beer and nachos and peanuts while letting the day go by, as if you have not a care in the world? i thought not. and what a happy coincidence that the braves were in town! slow chop! such bliss! we met up with my dear friend behrle, whom i met years ago on one of my first trips to dc. i only see her once or twice or year, so i was just ecstatic she could make time to join us. it made perfect sense to take advantage of the miller lite scoreboard happy hour for six dollar beers, so we started there and then took a tour around to our seats in section 408. as we found out, and in case you were curious, row N of this section happens to be the very top row. well, considering how dang windy it was that night, we didn’t hesitate at all in hopping down a row to save ourselves. thankfully no other fans arrived to kick us out of the seats, so we weren’t as cold as we could have been. the start of the game was about twenty minutes away, and brian spoke up to remind us that the happy hour ended at the first pitch. well, let’s get a move on! brian, evan, and i made it back over to centerfield just in time to place one of the last happy hour orders with the bartender. sweet victory! you know, sometimes it’s those little things that just make your day. i think it was in about the fourth inning that i decided food was a requirement, so behrle and i hustled down to the concourse for some sustenance. i of course had to get a hot dog, and since i was extra hungry, nachos also came back to my seat with me. there really is something quite nostalgic about a baseball park and its food and atmosphere and feeling that just always makes me want more. good thing the season just started! i was so glad to make it to an opening week game, and the company of those around me made it even better. although i would have stayed through the bottom of the ninth, the wind was whipping so badly, especially in our section, that we left after the seventh inning stretch. at least we got to sing “take me out to the ballgame!” and, even better, the braves took home the win! it was a good night for atlanta fans. walking back home really was out of the question, so we packed into the metro stop with the hundreds of other fans to wait for the train. 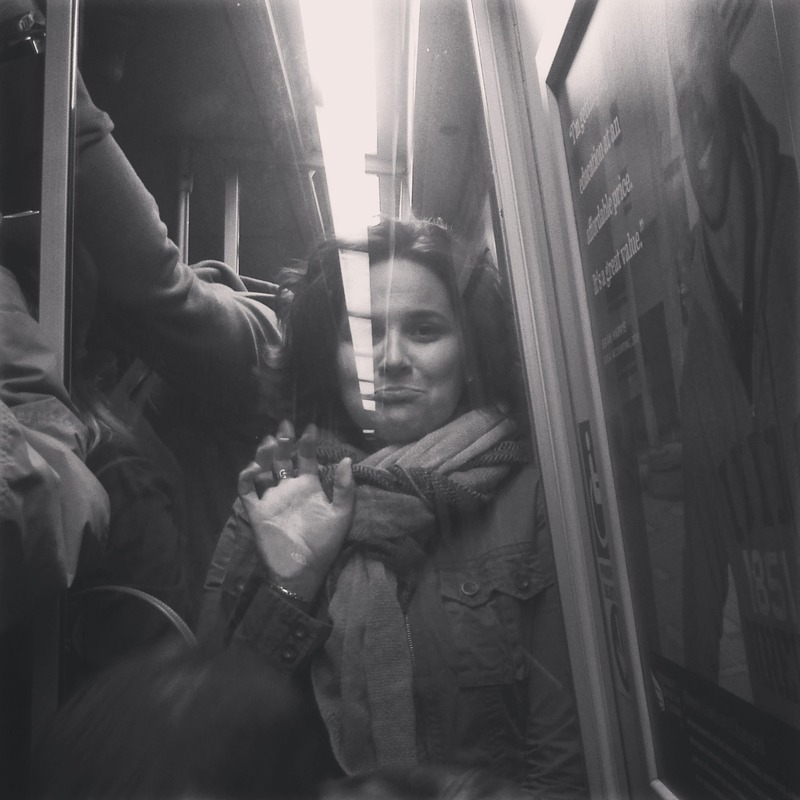 i’m not a very aggressive metro-rider, so as we all pushed and bumped our way onto the car, i, to no one’s surprise, was separated from the rest of the group. i wasn’t far away at all, but i was on the other side of the plexiglas partition, and this photo that evan snapped really is priceless. how pathetic and adorable all at the same time! we weren’t all ready to call it a night just yet, so per behrle’s recommendation we found ourselves at trusty’s, the hill’s neighborhood tavern. when you think of dive bars, places like trusty’s come to mind. the place has obviously been around for a while, and you know it’s the kind of bar where locals come when they want beer from mason jars and a friendly face. the five of us squeezed into a back booth after grabbing some drinks and decided that dirty jenga was a totally appropriate game to be playing. sure, why not! this version of jenga has suggestive dares written on each piece, so when you go, you get to do something racy, like lick the face of the person to your right or dance on the bar when the next song starts. although we hadn’t had that much to drink, it was still fun to see what people had written on the pieces. it only makes me wonder, would those folks have done these dares themselves? i suppose we will never know! after a second yuengling, i needed to fuel up again. yes, more food! i had noticed the huge grilltop right next to the bar, and what was it i craved at that exact moment? a grilled cheese. oh my gosh, yes, please. gooey cheese and crispy buttery bread. the bartender brought it to the table and i devoured it in nearly record time. as far as i can remember, it is the best grilled cheese i have ever had in my life. no contest there. soon thereafter we all realized we were a bit taxed from the exciting days we had had, so we paid our tabs, buttoned up, and went home to rest our heads. oh, dc, you were too sweet to us!